Dr Dennis Gross is best known for his daily Alpha Beta Face Peels, and building on the success of them, he's created the Medi Spa Peel. This weekly treatment is a powerful resurfacing peel designed to lift the complexion and revioatlise the skin. Step 1 - the wipes - contains 15 fruit acids which gently lift dead skin from the face and remove blockages from the pores revealing a brightened complexion. Step 2 - Peptide Milk - neautralises the fruit acids and balances the skin's pH level whilst toning and hydrating the face. Dr Dennis Gross Alpha Beta Medi-Spa Peel is the next step-up from Alpha Beta Daily Face Peels. 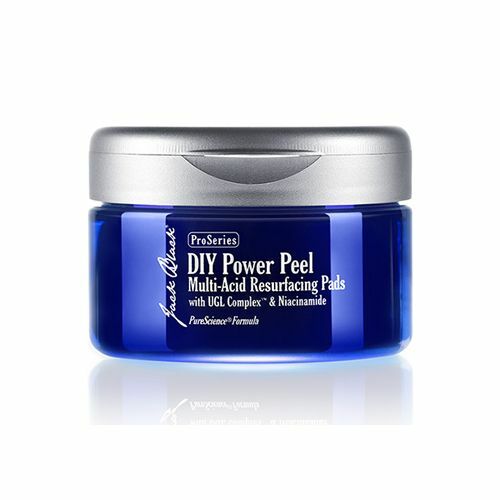 This fruit-acid-rich weekly peel has the ability to completely overhaul the complexion and reveal a newer, more youthful looking finish to the skin. Formulated with the same ingredients used by Dr Dennis Gross in his New York Skin Clinic, the Medi Spa Peel offers you the chance to get professional results in the comfort of your own home. Water/Aqua/Eau, Alcohol Denat. (SD Alcohol 40-B), Lactic Acid, Glycolic Acid, Potassium Hydroxide, Mandelic Acid, Polysorbate 80, Hamamelis Virginiana (Witch Hazel) Extract, Citric Acid, Malic Acid, Pyruvic Acid, Tartaric Acid, Gallic Acid, Ellagic Acid, Potassium Azeloyl Diglycinate (Azelaic Amino Acid), Linoleic Acid, Linolenic Acid, Lactobionic Acid, Salicylic Acid, Phytic Acid, Carica Papaya (Papaya) Fruit Extract, Hexylresorcinol, Rehmannia Glutinosa Root Extract, Salix Nigra (Willow) Bark Extract, Camellia Sinensis Leaf Extract, Jasminum Officinale (Jasmine) Flower/Leaf Extract, Lavandula Angustifolia (Lavender) Flower/Leaf/Stem Extract, Eugenia Caryophyllus (Clove) Flower Extract, Vitis Vinifera (Grape) Fruit Extract, Sodium Hyaluronate Crosspolymer, Sodium PCA, Chamomilla Recutita (Matricaria) Flower Extract, Caprylic/Capric Triglyceride, Glycerin, Propanediol, Menthyl Lactate, PEG-20 Oleate, Disodium EDTA, Alcohol, Potassium Sorbate, Sodium Benzoate. Use once weekly. Apply the pre-soaked pad to clean, dry skin. Leave for 3-5 minutes then follow with step 2. Do not rinse after use. Do not use products containing alcohol afterwards. Use once weekly for 16 weeks. Best used before going to bed.